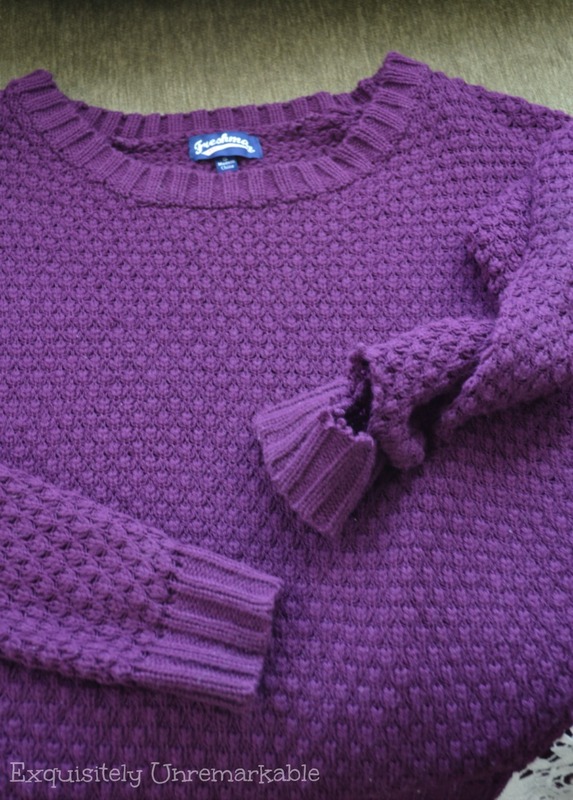 Is there a rip in your favorite sweater? Have no fear, you can fix it in a jiffy. Even if you've never sewn before. Come see! I know that there are a lot very proficient seamstresses, knitters and crochet experts who could fix this sweater in a jiffy. In real life, I know none of them. People are constantly asking me to do very small repairs, because they don't even know where to begin. 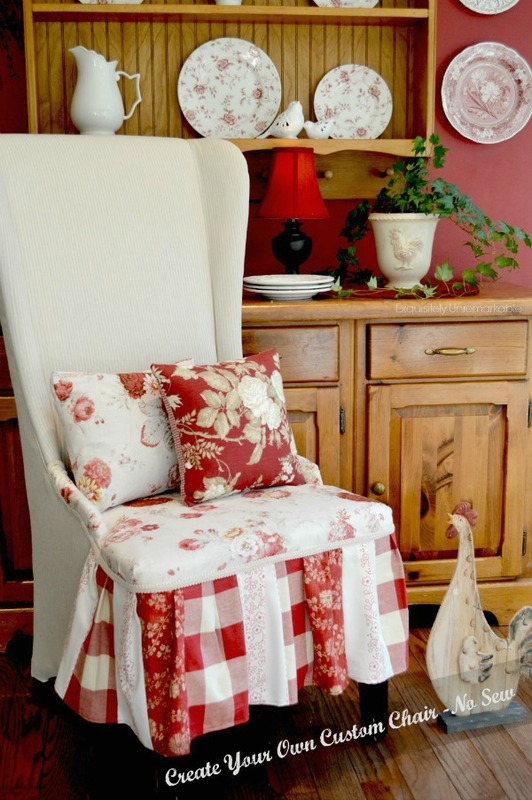 I am always astonished, sewing is actually very easy, but I guess to some, it is very intimidating. I used to be the costume mistress for a local children's theater group. I cannot make clothes, but I possessed enough rudimentary sewing skills to rework, refashion and alter items to make them into some pretty fabulous pieces for the shows. Unfortunately, kids are not careful and small tears happened all the time. Trim fell off during dress rehearsals and basted seams got stepped on and torn. During tech week, I was sewing nonstop, because it was next to impossible to find someone, anyone who felt comfortable enough with a needle and thread to help out and repair their own kid's mess. With this in mind, last night when I sat down to repair my daughter's sweater (a kid, not careful), I decided to document the steps in case someone could use the tutorial. Again, it is super basic and pretty self explanatory, but if you are terrified of the word sewing, maybe this will take a bit of the fright out of it. Maybe. There's an obvious tear in the sleeve. Not good because it's torn, but good, because it's on the seam. Now I have no idea how to repair this with yarn. 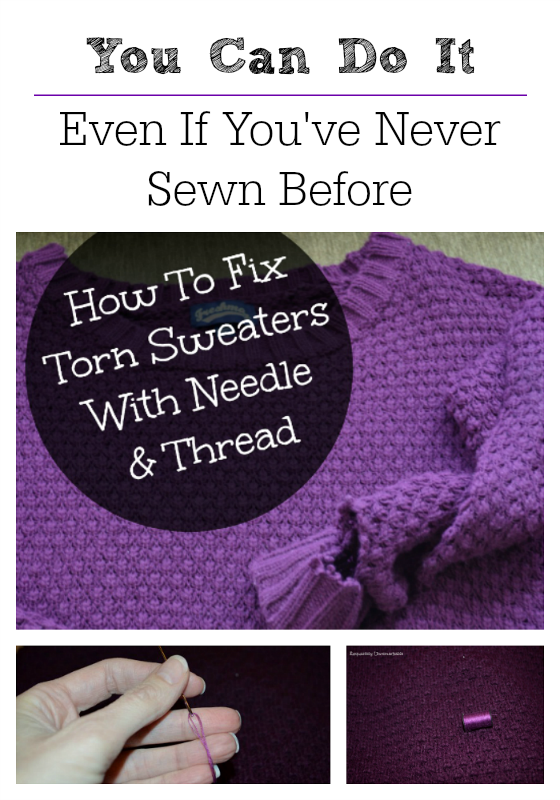 I'm not a knitter and even if I were, there are so many stitches out there I wouldn't know where to begin. So I opted for a needle and thread. It is a tight enough weave that you will never see it. I matched the thread with some I had on hand. Do you see the size of that spool? Yeah, it was included in some tiny pack that I picked up years ago, proof that I am not an expert. This is what they give you in the complimentary hotel pack. No self respecting seamstress would work with this stuff and to be honest if I were using a sewing machine, I wouldn't use it. It isn't a great quality, but it's free and it matches and if my growing, fickle teenage daughter gets one more season out of it, I'm good. Next, I threaded a fat needle with two strands and then I doubled them. I knotted the bottom with a pretty big loop. I essentially used four strands. I needed a thicker weight to hold the heavy yarn together. Now, I was ready to go and I just stitched the sleeve up. But how exactly, you ask? 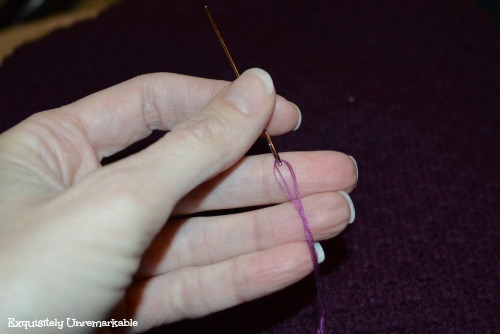 A basic stitch, up and down, moving along the tear from one opening to the other working on the inside of the cuff . You always want to sew on the inside of the garment to hide your stitches. 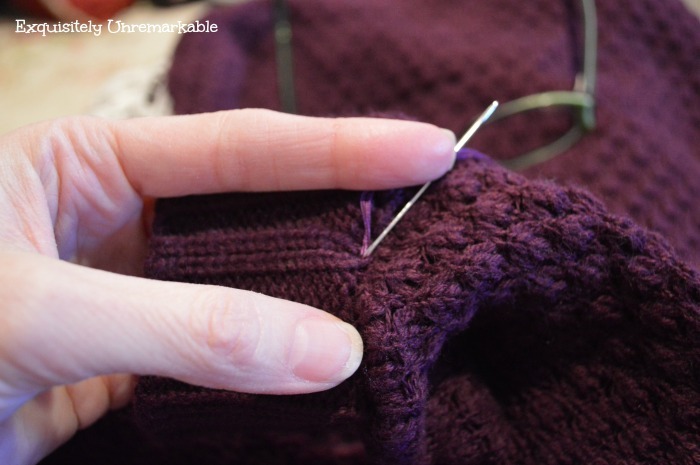 As I moved along, every few stitches or so, I flipped to the right side of the sleeved and I used the back of the needle to tuck in any stray pieces of torn yarn. I wanted to make sure they were in the right place to get caught by my stitches. When the hole was closed, I just knotted the thread and cut it. That's it. That was the whole repair. It took me about ten minutes to complete. The repair is not noticeable at all and if it were, I could cut it away and start over. No harm, no foul. See. Not scary at all. Well, until I find it on the floor in the laundry pile tomorrow morning after it wasn't even worn. Then I may get scary! 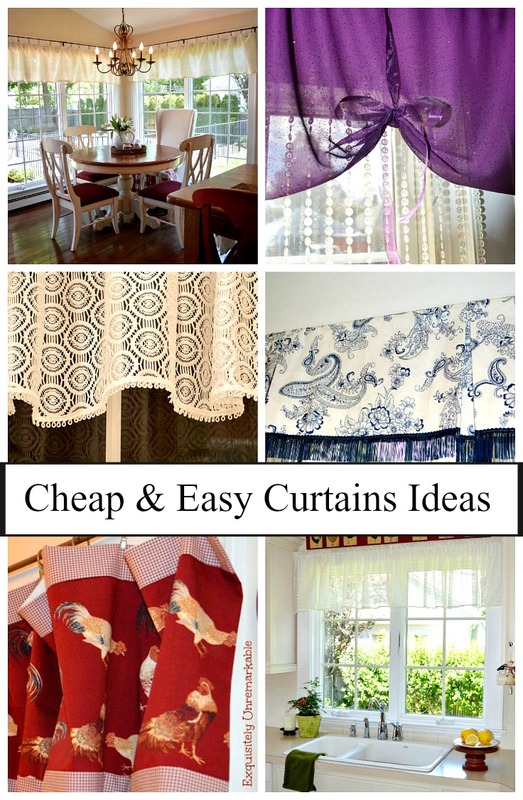 Now that you can sew, check out these posts! Florida, huh? You lucky, lucky girl! I told my husband, let’s just drive far south enough to where I can take my coat off!! ;) ) Thanks for the comment, Vanessa!! Nice job! You can't even tell it was ripped! Thanks! It was so easy, Kimberly! I possess "rudimentary" sewing skills as well. My problem is just breaking out the needle and thread and doing it. I have about four garments sitting on my sewing machine with various issues. The most memorable case I had recently of a garment that needed repaired - my son's friend was over visiting, and he and my son were wrestling, and he tore his crotch in his jeans. So... because it was in a bad place, I offered to stitch it up, and amazingly, was able to make it look pretty decent. Your tutorial was great... and I think it is awesome to share simple techniques like this, because sewing does seem to be a lost art! Oh - and I have a ton of those "cheap" threads as well.... lol! That's a funny story! I have that same issue...truth be told, that sweater sat around for weeks. My daughter finally prodded me into fixing it. I definitely needed a push! Give me a sewing machine any day! You did an amazing job, Kim! I sew and I now have my own craft room. I am looking for a dressmaker dummy that I can afford and is not a size 2. I like to buy things at consignment stores, Goodwill, etc. and do them over into what I want. I love the way you fixed that sweater, most people would throw it away. Hi Kim, you did a great job fixing your daughters sweater and a nice tutorial. 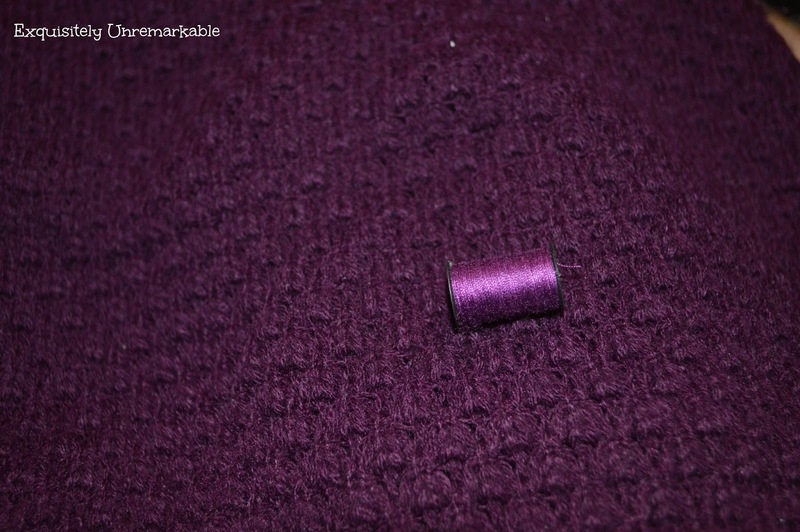 I can sew basic things that need repairs like you did or a button! Enjoy the rest of the week and stay warm! Great tutorial. 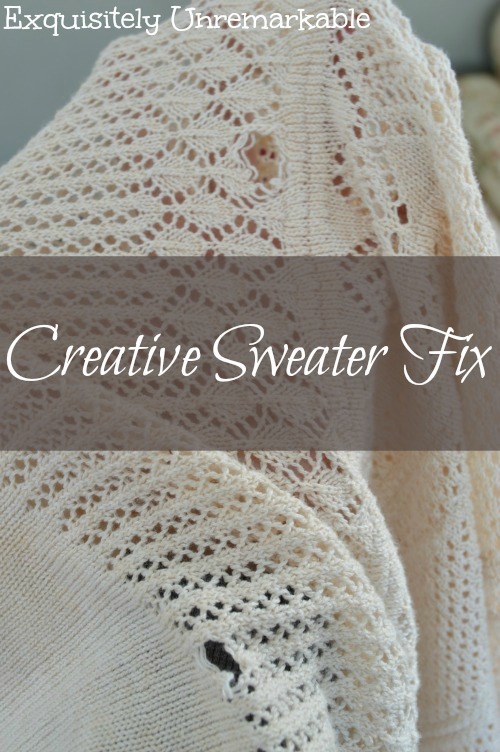 I agree with some of the other commenters about sewing being a lost art and that some would have thrown the sweater away instead of taking a few minutes to repair it. We all have different skills and interests and what is old hat to one might strike terror in the hearts of others. In your tutorial you seemed to assume that your reader has no knowledge and that is a great place to start. 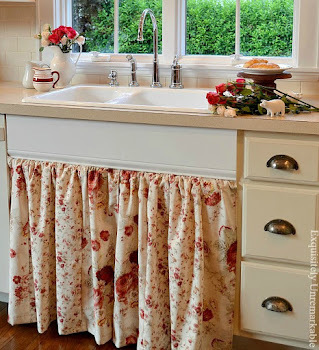 A person with no skills (yet) may come to realize that it is easier than they thought and even a person who has those skills might be inspired to actually tackle the sewing projects sitting next to the sewing machine. Hi Kim! That's definitely one skill my mom made sure I learned. I used to sew my own clothes, then I sewed a lot of my kids' clothes and doll clothes...so much cheaper. I mostly just sew home decor stuff now. It's a handy skill to have. I learned the basics when I was young too, Cecilia. My grandmother, mother and aunt all sewed, out of necessity I think. I also learned in Home Ec in junior high. I am not even sure they offer that class anymore, but they should! That looks absolutely perfect, Kim. Sounds like you must be very creative if you were able to alter and redesign costumes. Thanks Susan! It was an easy fix. The costume work was fun to do, it involved a lot of trial and error! I definitely got better at it over the years! Thanks for stopping by and leaving a comment! You are very creative to do that for sure. And to keep your cool. I do sew, but I always appreciate pointers. I am not a professional at all, I still make silly mistakes. This was well done, Thank You! Theater was fun...the ball gowns were the best! Thank you! This will me some serious money! That's true, Cari...even the dry cleaner charges a ton for alterations! So, a Singer treadle, huh? Somehow Rue, I couldn't picture you using anything else. You, my friend, are the real deal. Very cool! Nicely mended! It is a good reminder how a little bit of stitching can easily rescue pieces of clothing in this way! Thanks Helen! I just couldn’t throw this away. I just repaired my daughter's bunny finger puppet. She has a whole set and I've nearly mended every one of them. My biggest complaint is how poorly they were made.....I'm not the greatest sewer in the world but I can sew enough to get the job done. Looks like you did a great job on that sweater! A few days ago I was delighted to discover your light-hearted and encouraging article. Thank you for sharing it! 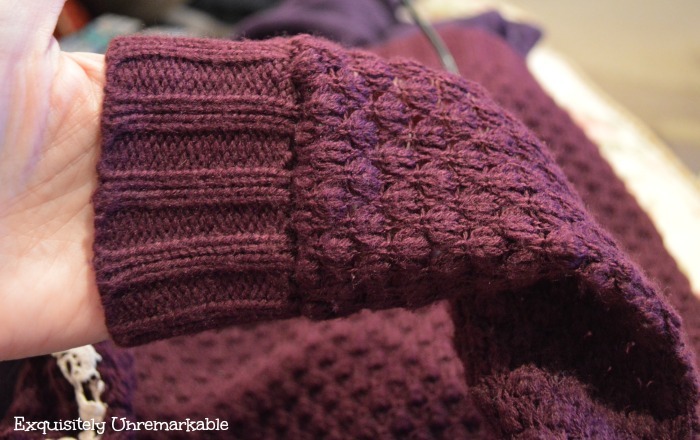 The sleeve of my sweater was torn in a similar fashion at the cuff. Like a lot of other guys would do back (mannyyyy years ago) in my military days, I would either pay someone to sew on uniform stripes and patches or try my luck with iron-on adhesive. It was while looking for some form of iron-on miracle cure to repair the damage that I came across your neatly crafted instructions. 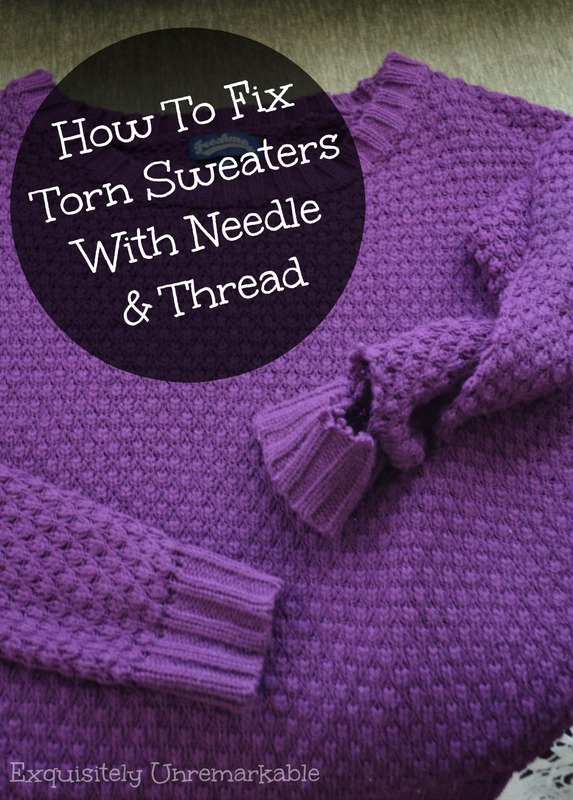 After some procrastination I sat down with sweater, needle, thread and reading glasses. You were right. It wasn't nearly as scary as I thought it might be. Like so many things in life, it's often the little successes that bring such a satisfying sense of accomplishment. Thank you again, Kim. Best wishes to you and yours for the New Year! Phill, your comment just totally made my day!! Thank you for taking the time to let me know that my post helped you out. 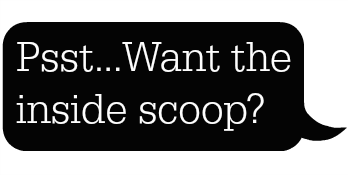 The mission statement behind my site is to encourage and empower people to try that DIY. I am so glad that you did. Like you said, that sense of accomplishment is a wonderful feeling and hopefully you saved yourself a few bucks! ;) Happy New Year to you, too, Phill and again, thanks for kind words!